Home Technology Using science to justify manspreading? Don’t. Using science to justify manspreading? Don’t. When a marketing campaign is designed specifically to target men who can’t keep their legs together, you know something’s wrong. Anyone who’s taken public transportation can spot a manspreader a mile away. Spilling out beyond the confines of his seat and sometimes taking up two to three of them, the man spreads his legs as though he’s a king on a throne and we are mere subjects in his kingdom forced to shrink in on ourselves to avoid an involuntary snuggle. The epidemic of guys taking up more than their fair share of seating on buses and trains has become so widespread (pun intended) that the word “manspreading” made it onto the list of the Collins English Dictionary’s top words last year. The behavior is rude and annoying, especially when a subway car is full to capacity and space is at a premium. Yet some men are now claiming science as an ally in their quest for Manifest Destiny of public seating, arguing that taking up too much space isn’t a power play or an act of sexual aggression, but a biological necessity to feel comfortable. “Our new analysis suggests that manspreading is something men do to adjust for their body proportions — especially their high shoulder-to-hip ratio — and not an act of transgression against their fellow passengers,” according to Ash Bennington, who wrote a piece titled “Manspreading: The Myth & The Math (Dude)” last week in EconoMonitor, where he is editor-in-chief, after consulting with data scientist Mark Skinner. Though I do not own a male body, I get that biology is real and some men might find it mildly uncomfortable to sit with their legs sufficiently together to comfortably make room for fellow passengers on either side (a male CNET colleague confirms that sitting like this isn’t ideal, but also assures me it’s not painful, nor will it damage his anatomy). But reality check: in today’s world, public transportation and discomfort go together. Dude, you’re just lucky the bus is so empty. I’ve sure got my own list of reasons a subway seat isn’t comfortable. I’m curvy with wide hips and big thighs, and you know what? I still only take up one seat. Why? Because that’s what people with manners do. We all wish we could be super-relaxed while commuting on public transportation. But on a train where strangers are packed together like sardines, if your response is still to sprawl across three spaces for your own comfort, you’re taking self-care too far. 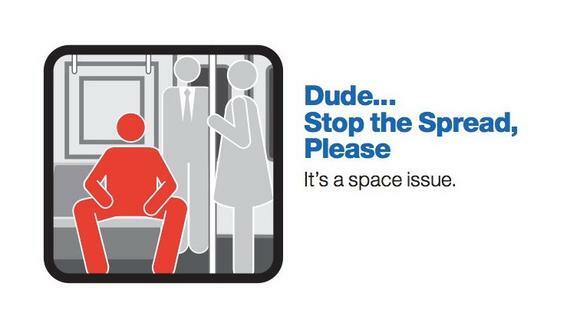 This epidemic of men treating their groins like they need a 3-foot safe-fly zone has gotten so bad that New York City’s Metropolitan Transportation Authority started a “Dude… Stop the Spread” marketing campaign in 2014 asking for men to reconsider manspreading for better acts of etiquette. Not surprisingly, posters asking aggressive thigh spreaders to sit like everyone else on public transportation didn’t do the trick. It’s two years later, and the scourge of men taking up as much space as possible is still, well, a scourge. Ask 100 manspreaders why they spread their manhood, and you’ll probably get a bunch of different responses. I, however, believe there are plenty of men out there who spread their legs as a way to show their dominance in public, to pretend their cajones are just so big they can’t be hidden from mere mortals. If that’s truly the case, perhaps they should entrust their giant genitalia to Uber instead of trains, buses and subways. In some cases, manspreading can even feel like sexual harassment. I’ve been on trains in San Francisco where there are hardly any passengers, and in enters a man who sits right next to me and spreads his legs not only to take up other empty seats but to push my own legs out of his way. It’s an aggressive act, and no, I can’t just push back with my own legs — women know from experience there’s a danger that’ll be taken as encouragement. So I end up time and time again getting up to stand because I’d rather be physically uncomfortable than emotionally distressed by a dude who just can’t sit properly. Don’t get me wrong. Not all men manspread. Though in the 30 years I’ve been using public transit, I’ve never seen a woman pull this kind of seating dominance. Some women might take up the seat next to them with a backpack or tote, but it’s not quite the same thing as spreading our legs and acting like we need a conductor for our own nether regions. But at least manspreading has me thinking creatively. Because of the dreaded practice, I’m thinking of starting a “craftspreading” trend where I bring my latest craft project onto a crowded subway and fill the seats around me with yarn, googly eyes and piles of glitter. Why? Because it’s just more comfortable for women to crochet in more than one seat — and I’m sure I can find knitting physics and sewing statistics to back me up.